Street Pastors is a global inter-church charity, made up of 14,000 street Pastors in 360 areas across 5 continents. Founded in Brixton, South London, UK in 2003 by Rev. Les Isaac. It was based on a model from Jamaica in which individual churches joined together to take their values out onto the streets. The initial activities of street pastors in areas such as Lewisham and Hackney focussed mainly on confronting gang culture and the use of knives and guns. As Street Pastors started to operate in other areas of the UK, the initiative responded to other local issues, including anti-social behaviour and drunkenness. By 2008 there were Street Pastors groups in 70 locations, with another 50 being established. As of January 2015 the official website states that there are over 270 active groups. Street Pastors undergo 12 days of training in order to voluntarily patrol the streets of towns and cities at night, helping and caring for people in practical ways. Street pastors wear a blue uniform, with the term ‘Street Pastor’ visible in white. They work closely with councils and police in their local areas, but maintain an operational independence and seek to maintain confidentiality so far as is legal, and do not have any powers of enforcement or arrest. Street pastors are expected to provide services unconditionally. The aim is not to proactively preach or evangelise, but to provide a neutral and reassuring presence in local communities. The local volunteers make up the 22 strong trained Ayr and Prestwick Street Pastor team, which seek to listen, care and help people who perhaps need a bit of extra support on a night out. They started up on 5th December 2015 and have already helped and cared for many people. Co-ordinator Gilly Baldock said they are also forging links within local communities, the police and council. If you would like more information please call 01292 262546. 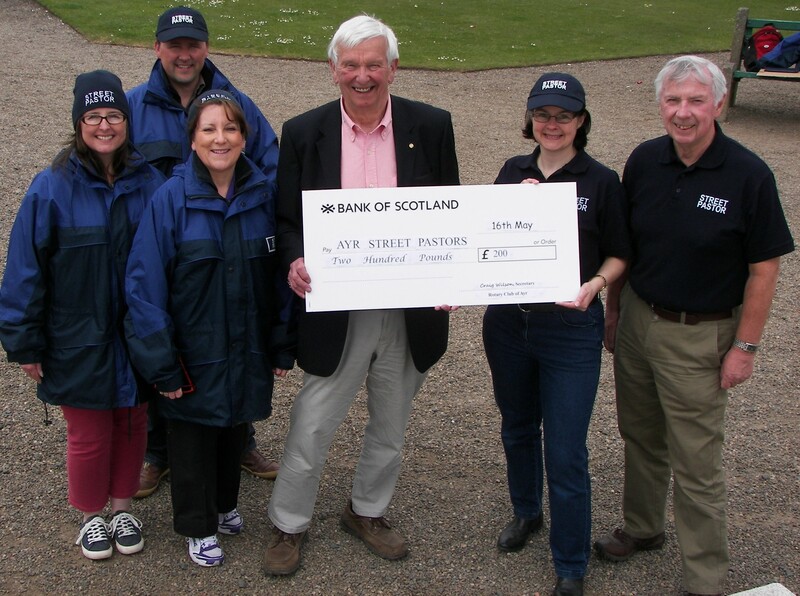 Community Services Convenor of Ayr Rotary John Ewing presents a cheque for £200 from the Treasure Chest Fund.